Designed to appeal to younger drivers, the ‘Arrive Alive’ images have gone on display on roads and in town centres across the region as part of National Phone Awareness Week. 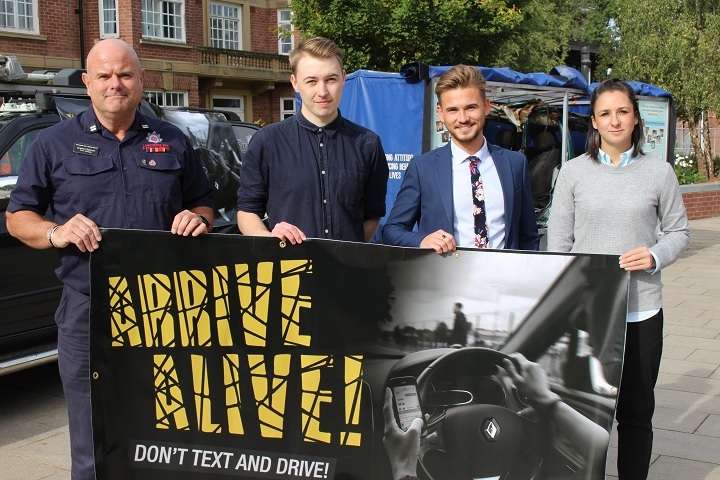 The campaign was devised by Edge Hill University Business School graduates James McGarrie, Mark Williams and Alice Stockton, as part of a project with the Lancashire Road Safety Partnership (LRSP). Mark Williams, marketing and digital communications graduate, said: “This project followed months of theory and allowed us to bring all our knowledge together into a ‘real life’ campaign. “We took inspiration from things that appeal to young people to make it relatable, the alliteration, font, colours. The shattered letters are meant to look like a broken phone screen. The project arose following a discussion between Dr Susie Marriott, the university’s marketing and society module leader, and Chris Kenny, Lancashire Fire and Rescue Service’s chief fire officer – who highlighted the impact on the emergency services of texting while driving. The campaign’s artwork is also being used by Lancashire’s Police and Fire and Rescue Services, local councils and Highways England. Rhiannon Leeds, LRSP coordinator, said: “You’re four times more likely to be involved in a collision if you use your mobile phone whilst driving. Graeme Spencer, Lancashire Fire and Rescue’s crew manager at Ormskirk, said: “We’ve seen a rise in road traffic collisions related to mobile phone use. As a crew we cover a large rural area with lots of unlit and potentially dangerous minor roads. It could also have shown and highlighted another problem by showing the young person crossing was also using a hand held devise as that is also responsible for someone to inadvertently step off the kerb and into the path of an oncoming driver who’s attention was also affected. Both using mobile devises brings the danger of merely walking with one to sight and to mind and can be expanded upon also. “DON’T TEXT AND WALK !” May be another useful Campaign aimed at young people.